OK, that’s Time magazine’s thing. But we totally agree. 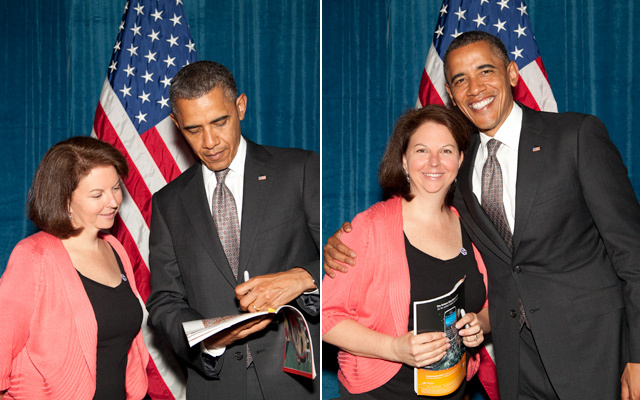 I’m no Pete Souza and I didn’t have 48 hours with the President, but I do have a few photos and a story to share. 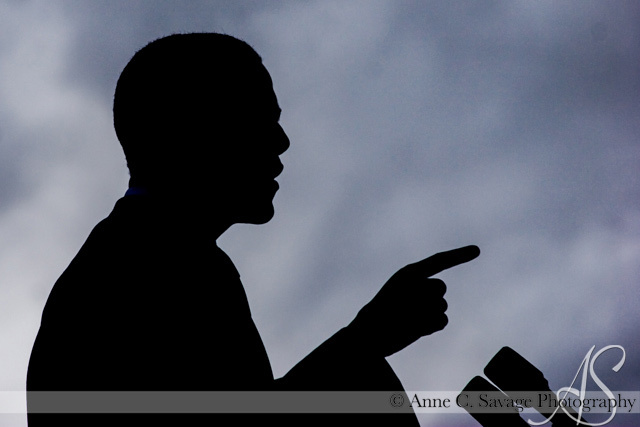 Over the last four years I have had the privilege of photographing Barack Obama many times and, as I tell my story, I will include a few of my favorite photos as a tribute to Time magazine’s well-chosen Person of the Year and a little something for you at the end. 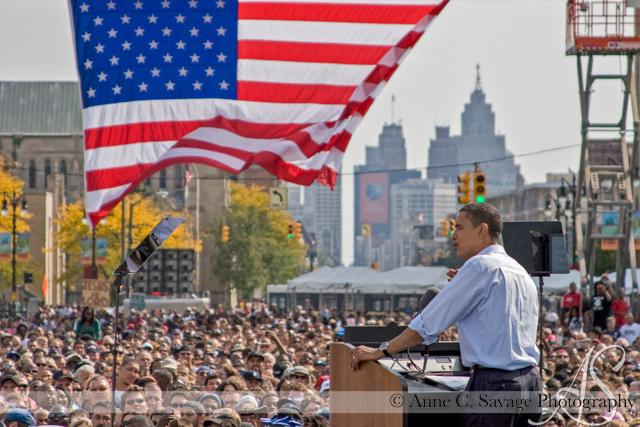 On June 16, 2008, I stood outside a door on the south side of Joe Louis Arena with several other photographers and media people waiting for approval to be part of the media coverage of Barack Obama’s visit to Detroit. You see, a few days before that, I had read in the paper that Obama was coming to Detroit. I contacted the Detroit Free Press and asked if they would be interested in a panoramic image of the Obama rally at Joe Louis. They said that they would and we agreed on a price. However, they told me they could not give me media credentials to get in. I was on my own. I was a little bummed about this, but didn’t let it stop me. I headed to Detroit early and got in the media line to pleaded my case to the person in charge. 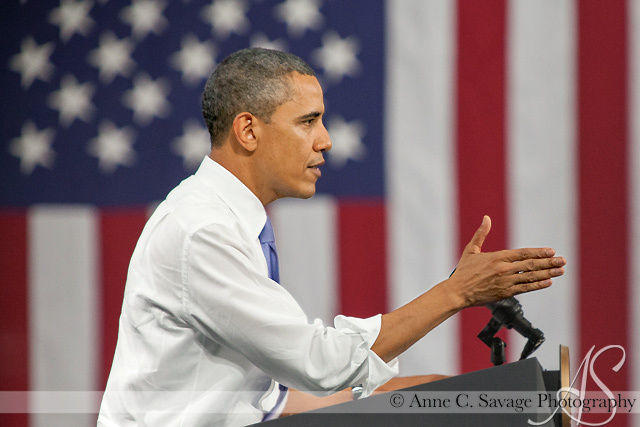 They let me in that day and that was the start of my photography journey with Obama. I photographed the then-nominee for President along with Vice President Al Gore, who endorsed him that day, in an arena full of over 20,000 people. I also got the panoramic image for The Detroit Free Press. It was thrilling. Obama’s next rally in Michigan was on Labor Day and the Detroit News hired me to do a panoramic image of that rally, as well. 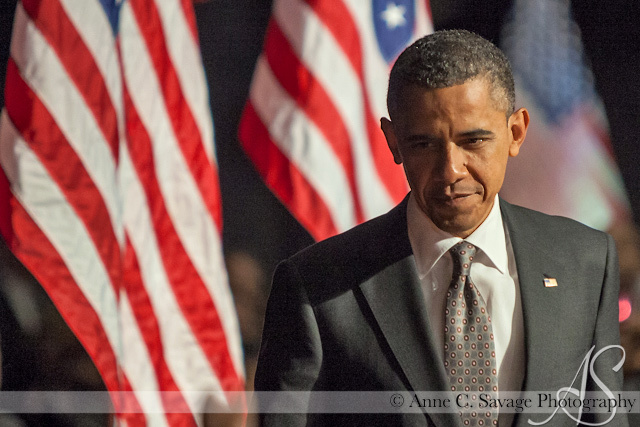 As I walked up to the media table that day, I was approached by a woman who worked for Obama for America (OFA) and asked, “Are you Anne Savage?” She said that she saw my panoramic image of Obama at Joe Louis and was very impressed. 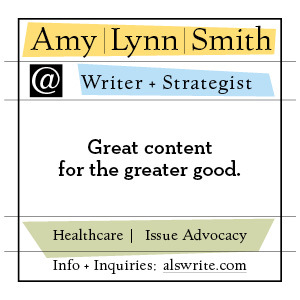 She said it went viral with the OFA group in Chicago. She gave me her card and said to contact her if I wanted to photograph Obama if he returned to Michigan for another rally. He did return, several more times, in fact, and I was there for each one. 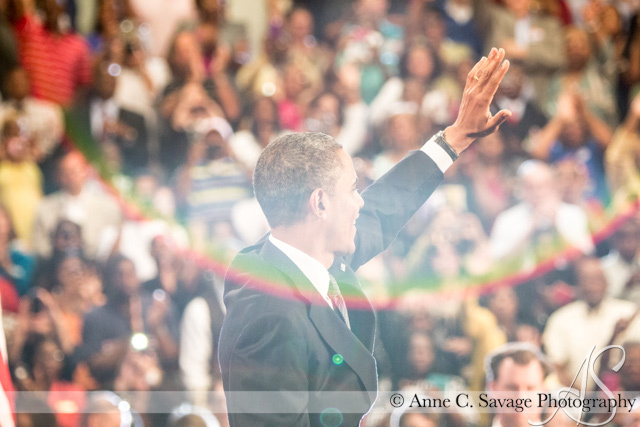 On Nov. 5th, 2008, the day after the election, I was so full of energy; a major adrenaline high. There was no more volunteering to do or doors to knock and no more photos to be taken for the election. So, to release some of that energy, I decided to do something with the images that I had taken over the summer at all the Michigan Obama rallies. I wanted to create something that reflected what I felt was the overwhelming message that came from the election: Out of many we are one. I used the faces of people in the crowds to create a photomosaic of Barack Obama. Below is the mosaic I created. Zoom in to see the faces up close. I posted this image on Flickr and my website and had some posters made. I was selling them in a few stores throughout the area and online. 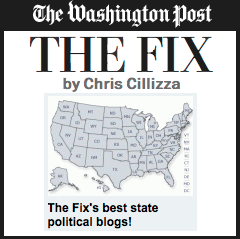 A few days after I posted the image publicly, I was approached by Time Magazine about using my mosaic. They couldn’t tell me why or how it was going to be used; only that it included me and the mosaic. They had a brief interview with me and that was it until Dec. 19, 2008. I woke up on December 19th to a phone call from my mother. She said I was part of a feature in Time magazine’s Person of the Year issue (If you click the link you will see my mosaic is the main image). 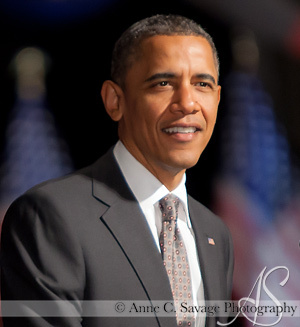 Barack Obama was chosen that year and as part of the issue they featured Obama artists and their artwork. My mother told me that my mosaic spanned two pages. I couldn’t get a copy of the magazine, however, because a giant snow storm had passed through overnight. I was snowed in and the trucks delivering the magazines were snowed out. It wasn’t until much later in the day that I actually got to see the Time magazine issue. 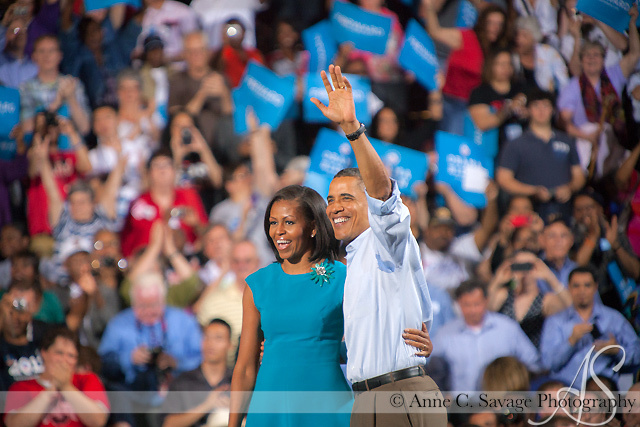 With the help of a good friend, I sold several posters to a person who knew Obama in Chicago. This same person gave him one of the posters and had him sign a second one for me. She mailed it to me and I was thrilled after I opened it to see that the President-elect had written, “To Anne- Thanks for the wonderful piece! — Barack Obama”. 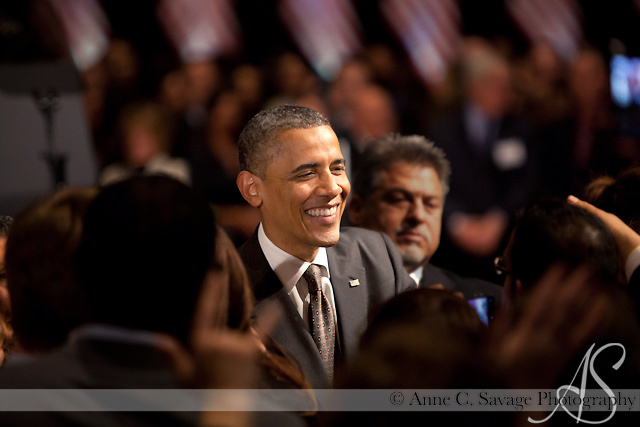 Over the next couple of years I got to photograph the President several more times and then, in the fall of 2011, I was contacted by a person from the Obama Victory Fund about photographing the First Lady at a fund raiser in Detroit. I jumped at the opportunity. 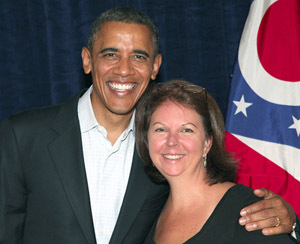 Over the next year, in addition to photographing the President at rallies in Michigan and Ohio, I became one of the official campaign fundraiser photographers for all of the campaign events in Michigan and northern Ohio. 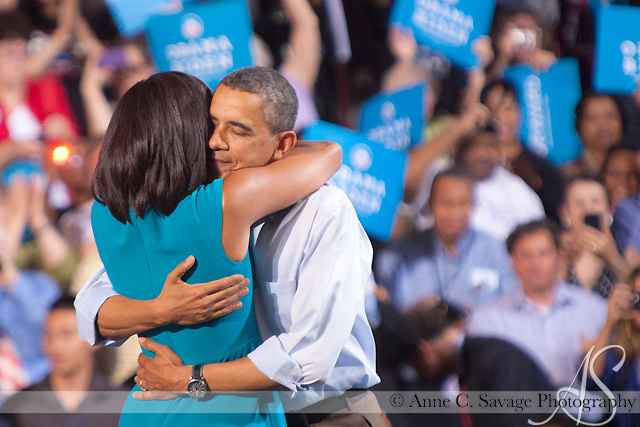 I was so honored to be a part of Barack Obama’s campaign. Needless to say, it was the thrill of a lifetime, only to be outdone by the second time we met in Ohio a month later. It was at the end another fundraiser and I was once again asked by Marvin Nicholson if I would like to meet the President. I told him that I already had, that he had signed my mosaic from Time and that I didn’t want to take up the President’s time. The President then turned to me and said “I think we should get a photograph with the photographer.” He looked me in the eyes and said “I want you to know that I still have your art”, referencing the photomosaic poster that he had been given in 2008 in Chicago. I have trouble describing how I felt after he told me that. To have your artwork recognized by someone you admire greatly is high praise. Obama art was not as prevalent in this last election, at least in the media it wasn’t. But many of us still were inspired by Obama and shared & sold works that we created. In the spirit of the 2008 election and my “Out of many we are one” mosaic, I created a new one as a reminder of this year’s election. It, like the first one, was created from faces at Obama rallies. I created it so that the faces are all looking or facing relatively forward to emphasize the “Forward” message from this year’s election. Zoom in to see it up close. In honor of Barack Obama being chosen as Time’s Person of the Year, I am selling two posters for $20 plus free shipping through the end of the year. You can choose two of the same or the set from both elections. I want to share a piece of this election with you. Our grassroots efforts made it possible to elect Barack Obama twice as our President, a President that will go down in history as one of our country’s greatest. We are in the midst of historic cultural and demographic changes, and Obama is both the symbol and in some ways the architect of this new America. 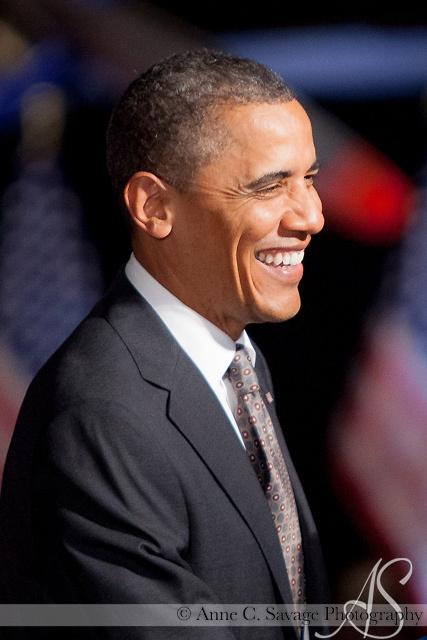 For finding and forging a new majority, for turning weakness into opportunity and for seeking, amid great adversity, to create a more perfect union, Barack Obama is Time’s 2012 Person of the Year.